Ahh, Summer. Although many of us could probably do without the brutal heat, there’s a certain romance to this time of year that tends to manifest itself in the evenings. Cicadas on the trees, fireflies in the meadows, frogs in the pond, there’s something magical about the season that lets us look forward to it every year. By the same token, there’s another much-anticipated arrival that makes itself known around this time each year- the latest core set. It wasn’t all that long ago that core sets were pedestrian affairs, filled with reprints of cards many already had. As we recently covered, this formula was turned on its axis with the arrival of Magic 2010, and each year the core set has found itself refined and advanced. From the “functional reprint” theme of M10, to the addition of a returning mechanic each subsequent year (scry, bloodthirst, and finally exalted in Magic 2013), there have been new cards and new twists on old ones each successive year. This has transformed the set into something looked forward to by many with all of the enthusiasm and anticipation of an expansion set. Following suit, we’ve seen still another twist this year with the selection of the returning mechanic. Rather than a keyworded one, this time around saw the return of a fan-favourite creature type, the Slivers. Originally introduced in Tempest, they returned in Onslaught block, then again in Time Spiral block. As we’ll see, this has by far been the most controversial. Sadly, it’s a tale we’ll be telling in the abstract, for amongst the five Intro Pack decks for Magic 2014 there exists not a single Sliver. We often hold up precons to be representative samples, museum pieces of the set they’re from. That might well be true, but this time around there will be left a gaping hole as the set’s returning mechanic is excluded in its entirety. What’s left? Well, certainly there is no shortage of new cards, as some familiar archetypes are given a fresh coat of paint. What’s most interesting about Lightforce is that it exists at the intersection of two distinct archetypes, both of which we’ve seen before in the preconstructed realm. The first of these is auras.dec. This was perhaps most notable back in 2010’s Rise of the Eldrazi thanks to the prominence of the totem armor mechanic, as featured in the otherwise forgettable Totem Power deck, but the build-your-own-beater concept goes further back still. Almost five years prior saw Custom Creatures appear in Ninth Edition, and there have been others that have relied heavily on the mighty aura. The other interesting direction taken by this deck is the lifegain approach. There have always been cards that let you gain life, but the idea of a viable lifegain strategy has started to coalesce as a cross-generational platform much more consistently in recent times as Wizards has sought to give a competitive advantage to gaining life above and beyond just making you harder to kill. Lorwyn’s Ajani Goldmane read your life total for the power and toughness of an Avatar token creature, while the Felidar Sovereign helped turn it into a bona-fide win condition (updating the Judgment rare Test of Endurance). This is evident from the outset, as a look at the deck’s contents reveals that both of its one-drops are dedicated lifegain cards. The pair of Soulmenders are simple 1/1 bodies, but they have the ability to gain you a life each turn. It’s not a great card, especially if drawn late, but played on the opening turn you can often expect a return of 5 life or more over the course of the game. Moving up to the two-drops, we find one of the deck’s lifegaining linchpins, the Voracious Wurm. A specialised update of the Runeclaw Bear and one of the deck’s marquee inclusions, the Wurm has the potential to be outrageously large in the deck, given the presence of its lifegain suite. Crack your Elixir of Immortality, and by itself that gives you a two-mana 7/7- a bargain! We often find “feast or famine” cards balanced by being somewhat weak when played in a non-optimal state, but even played without so much as a drop of lifegain, the Wurm is respectable. The other card here is a reprint, the Capashen Knight. Originally from way back in Urza’s Destiny, this is another 1/1 body. Unlike the more gentle Soulmender, though, the Knight is built for war with first strike and power pumping. We see a bit less of that in White now than we used to, with toughness pumping being the more common variation, so this makes for an interesting (and useful) inclusion. Paying two mana for a 1/1 seldom feels good, but the Knight is unusually hardy. From there we find a similarly modest number of three-drops, beginning with the Auramancer. The first aura-based creature we find, the Auramancer returns to the core set after leaving it for a year after Magic 2012. With no less than eight auras in the deck, she’ll seldom be at a loss for work. This is specially useful considering that three of these are Pacifisms, so if your opponent manages to get rid of one of them, you might find a second use. 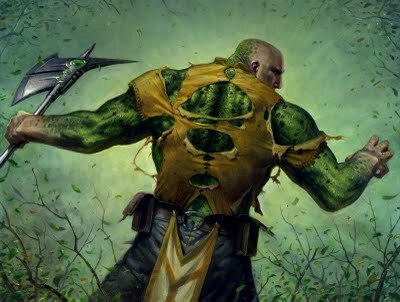 Then there’s the Banisher Priest, a variant on Innistrad’s Fiend Hunter with a squared power and toughness. These are superb inclusions, offering a two-for-one effect that’s relatively easy to cast (given the colour skew towards White) and leaves behind a relevant body. The deck gives you two of them, and taken with the trio of Pacifisms that’s not a half-bad removal package by modern standards. The Pillarfield Ox leads us into the deck’s four-drops, and in a sign of prominence you’re given a trio of them. The Oxen are nothing special, a reprint from Zendikar now appearing in its second consecutive core set, and they point towards a more defensive-minded approach. That’s not terrible here, as a lifegain deck by nature isn’t unhappy if a game goes a little longer. Still, you’d usually like to get more than a mere 2 power for your four mana. Next up is the Charging Griffin, which is a more aggressively-minded offering. A 2/2 in the air, it becomes a 3/3 on the attack, making it essentially a flying Benalish Veteran. Finally, the deck’s first rare appears in the form of Ajani’s Chosen. The Chosen is a purpose-built card that needs support to realise its potential, asking to be played alongside auras. This can give some very useful card advantage, though its a pity that Rancor didn’t get picked up in Magic 2014. A 3/3 for four mana isn’t dreadful, so the Chosen will have a role whenever it touches down. It’s a solid card here, and is another of the deck’s linchpins. At last we arrive at the deck’s closers, a pair of Serra Angels at the top of the mana curve. There’s not a lot to say about these that hasn’t been said already, as they’re a staple icon of the game and a frequent inclusion in preconstructed White decks. There’s also a pair of Dawnstrike Paladins, a new card which essentially saddles a Pillarfield Ox with both lifelink and vigilance. It’s not a bad card, and the lifelink of course is relevant here, but on balance you’ll probably prefer to draw an Angel. 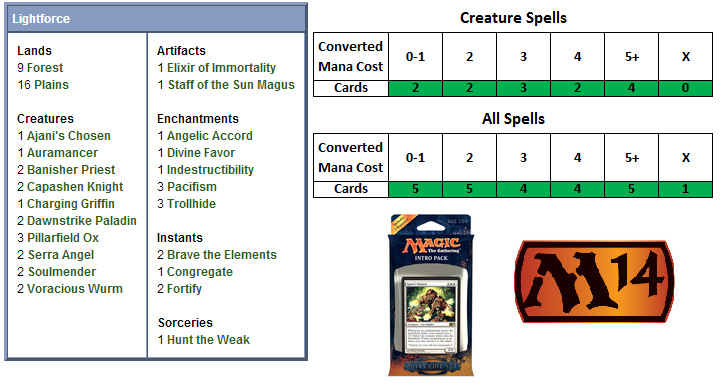 Lightforce has the least amount of creatures in an Intro Pack deck in Magic 2014, an honour it shares with Fire Surge. That means that it does a lot of its lifting through its spells and enchantments, and it comes as little surprise that this breaks somewhat evenly between the auras and lifegain. For the latter, we have several options including a pair of artifacts. Urza’s Saga’s Congregate finally makes the leap into mainstream printing, after having been picked up by a couple of premium products in the last couple of years (Commander and the original Planechase). As this deck is somewhat creature-light it won’t always deliver the heftiest of returns, but should usually be good for 6-8 life at the least. An Elixir of Immortality gives a nice, healthy dollop of 5 life when cracked, and shuffles your graveyard into your library. This is a fairly minimal effect, as milling isn’t a strategy supported in this environment. A Staff of the Sun Magus dispenses less at a time, but offers a steady stream instead of a one-shot effect. This is once of the new cycle of “lucky charms,” which include cards like Ivory Cup and Angel’s Feather. Although it costs more to deploy, it at least offers you the possibility of more life thanks to triggering on Plains. Of course, since it doesn’t trigger on your opponents’ White spells, it’s value is substantially reduced. The last card in this lot, Angelic Accord, is another payoff card for all the lifegain. A four mana, do-nothing enchantment, the Accord will occasionally spit out a 4/4 Angel token whenever you’ve managed to gain 4 or more life in a turn. This is an interesting proposition, as even with the plethora of lifegain in the deck 4 life is no small target. Of course, you only need it to trigger a time or two to dynamically change the game. In support of your auras, you have a few beneficial ones in Trollhide, Indestructibility, and Divine Favor. The last of the three also supports your lifegain approach, making it a bit more useful even if the bonus it conveys is somewhat modest. Trollhide too is nothing spectacular, but does give a useful boost. Indestructibility- the deck’s second rare- runs the usual risk of being responded to with instant-speed removal, but if it sticks it can be a game-changer on the right card. In addition to the Pacifisms mentioned earler, there’s one more piece of removal here in the form of a Hunt the Weak. A variant of Prey Upon, this gives your creature an extra shot in the arm before sending it to battle. Finally, there’s a bit of combat trickery as you’d expect in Brave the Elements and Fortify. The latter comes to us by way of Time Spiral, and offers two useful modes for its three mana. It will be interesting to see how the juxtaposition of auras.dc and lifegain.dec pans out, andwhether there’s enough of either to make the deck viable. We’ll put it to the test and report back in two days! Ah, launching right in to the M2014 decks! I think the deck deserves kudos for trying to make lifegain mean more than just gaining life. But it doesn’t look all that great in terms of implementation. Did you wake up this morning and write this, or did you have a heads up on the contents already? Right, but you had your article come out the very same day they were spoiled! Dedication! While i find M14 a bit underwhelming set as a whole (in comparison with M13), i kinda like this deck for trying two unusual white strategies instead of going for the weenie/skies deck. The banisher priest is a great creature overall, i’d be a nice fit in human decks. On the other hand, my favourite card from the deck is the Angelic accord. You need to set up the big life gain, but if you do, high reward (and free!). The fact that is repeatable, an enchantment and uncommon on top of that makes it the card of the deck, at least for me.